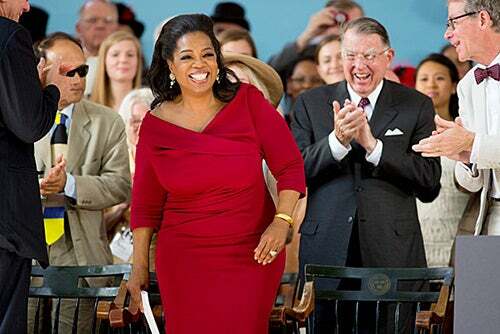 In her half-hour long address peppered with humor and thoughtful advice, Winfrey offered encouraging words and an inspiring message about facing adversity and living a meaningful life. 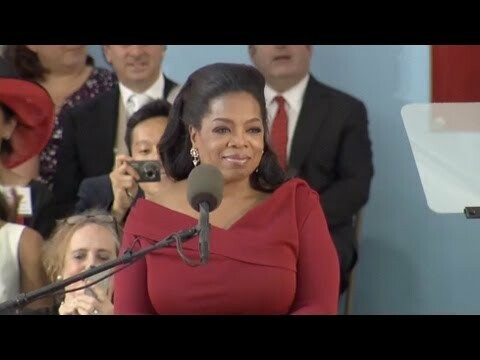 As Harvard graduates, she told the audience, they are able to understand the nation’s difficult challenges, such as a polarized electorate plagued by cynicism, the lack of a fair path to citizenship for 12 million undocumented immigrants, and a lagging public education system. Have more face-to face conversations with people you disagree with, she urged the Facebook and Twitter generation. Personal interactions are critical to keeping dialogue open, to helping people remember what it’s like to be in someone else’s shoes, and to validating others’ points of view. It was an unprecedented year, Faust said earlier as she welcomed alumni and members of the graduating class to the Afternoon Program and delivered her customary report on the year to the Harvard Alumni Association. The University hadn’t officially closed for a day for more than 30 years. “This year,” she said, “it closed three times.” Two of the closures were caused by bad weather, a winter blizzard and a fall hurricane. The last came during the Boston-area lockdown in the wake of the Boston Marathon bombings. Weeks ago, Faust recalled, climate scientists and relief workers attended a session sponsored by the Harvard Humanitarian Initiative and the Harvard University Center for the Environment to discuss how researchers and responders can collaborate better during natural disasters. The conference, Faust said, was an example of how Harvard’s faculty and researchers are working to address challenging issues. The projected numbers paint a grim picture, Faust said, since federal funding makes up approximately 16 percent of the University’s operating budget. “We anticipate we may see declines of as much as $40 million annually in federal support for research,” she said. Charles and Isabel Kurzon, Cambridge residents and members of the Harvard and Radcliffe Class of 1959, return to campus regularly, but made it a point to attend this year’s Alumni Association meeting to hear Winfrey and Faust. Charles Kurzon said to him, the most important message of the afternoon was Faust’s detailing of the impact of the federal budget sequester. Isabel Kurzon called Winfrey’s speech inspiring, adding that she was surprised to hear Winfrey talk about the struggles of her television network. “I think her voice is incredible. Everything she says comes from the heart,” she said.